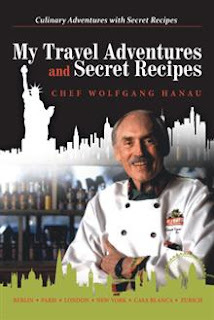 Chef Wolfgang Hanau, born and educated in Eastern Europe, learned to love good cooking from an early age, so it was only natural that he’d go on to become a world-renowned chef. What isn’t so natural, however, is his willingness to share the secret recipes he’s learned over a decades-long career at some of the world’s most exclusive restaurants, luxury hotels, and resorts. In this memoir/recipe book, he revels in dishes with a French flair, Bavarian specialties from Munich’s Oktoberfest, Switzerland’s renowned international cuisine, and dishes from the many great places he’s practiced his craft. You’ll laugh and smile as he enjoys camelback rides in the Sahara desert, cruises on luxury ocean liners, and meets celebrities at culinary destinations that offer sun, fun, and escapes from the ordinary. Along the way, he shares recipes that will impress your relatives and friends, including German Warm Potato Salad, the Allenstein BBQ Recipe, Bearnaise Sauce, Rainforest Acai Berry Cookies, Amstel Light Portobello Gorgonzola Burger, Golden Apple Cheddar Pancakes, Apple Jam-Filled Cookies, and Apricot-Glazed Mushrooms over Mixed Baby Greens. There’s an exciting story and a tasty dish for everyone in this book of secret recipes and travel adventures. Chef Wolfgang Hanau, a native of Bavaria, graduated with a bachelor’s degree in culinary arts from the Culinary Institute in Munich. He has worked in Switzerland, Paris, and London and has practiced his craft at many popular hotels and resorts. He lives with his wife, Diana, in West Palm Beach, Florida.